Great sketches, terrible crash!! How I envy you to be there sketching the Tour! 🙂 How do you follow the riders? 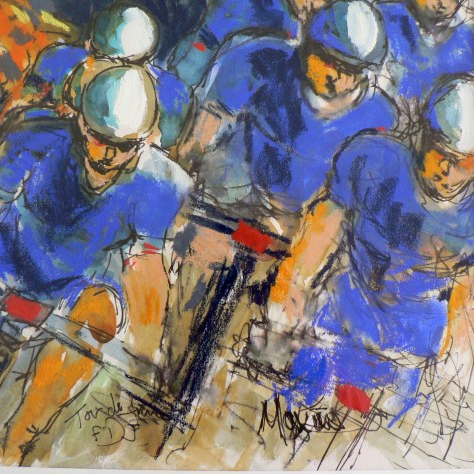 I have come across this Blog called: ‘Maxine Dodd: Racing Lines’ – check out some of the sketches of yesterday’s Stage three – it is a truly unique approach to the Tour De France! That’s fine – I have never seen cycling represented in that way, and I just thought it was very cool. I shall definitely be posting anymore you do on my blog as well! Maxine – your depictions of the race are so dramatic. You capture so much with your painting style and interpretation of the races. I saw bits on the news last night, what a day for the riders. Summed up Froome so well!